In a wok, heat one 1 tablespoon of butter and oil and quickly fry the carrots and celery, which have already been chopped into large strips. As soon as they start changing colour, add the halved shallots and fry briefly again. Put the vegetables to one side. Clean the chicken thighs, cut into large pieces, season with salt, pepper and a little sugar. Bring the wok to high temperature and fry the thighs until they begin to unstick from the bottom and are two-thirds done. Add the chopped mushrooms and, after a while, the sliced garlic. When the meat and mushrooms are cooked, add a little water or stock, boil briefly, and add the remaining butter. Turn off the BBQ, add the roasted vegetables and swirl the pan until the sauce thickens with butter. Taste, and season if necessary. 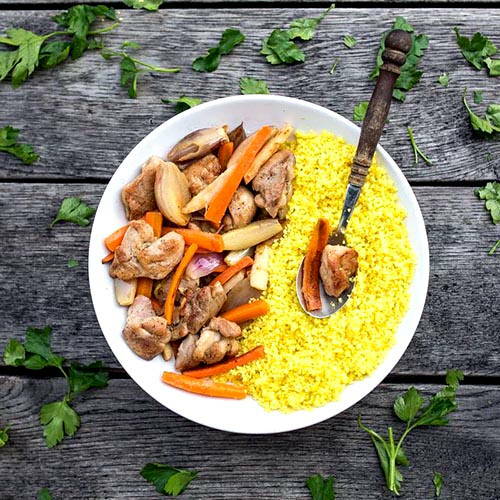 Mix the couscous in a bowl with a little salt, pepper and turmeric. Add the quantity of water according to the instructions on the packet and cover the bowl. Leave the couscous for about 15 minutes. If necessary, add lemon.